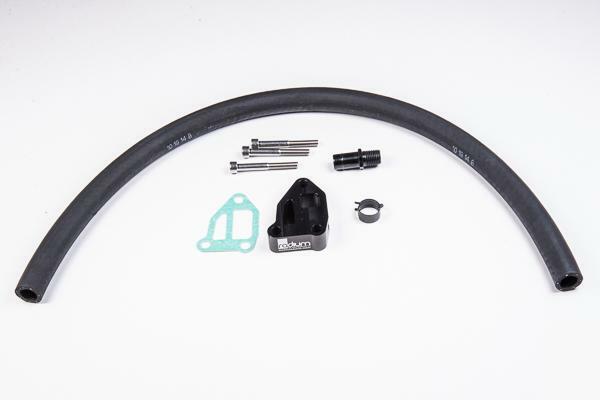 This Idle Air Control Valve (IACV) Spacer is compatible with the SR20DET engine commonly found in the Nissan Silvia S14/S15 chassis. The OEM 2-bolt IACV bypass hard line is replaced by this anodized aluminum IACV spacer kit to gain clearance for top feed fuel rails. An anodized aluminum barb adapter and rubber hose is supplied to reroute the charge pipe hose externally to the manifold. Three stainless steel bolts and one IACV gasket are also included. To purchase an additional gasket to replace your original IACV gasket, go HERE.